Video marketing is always a part of an evolutionary process. The more stories you tell the better you get at storytelling. While there is no foolproof blue print for creating a successful video, there is a foolproof starting position. That starting position is to ask yourself about your audience and here is 5 suggestions to get you started. There is no such thing as a typically person, we really are all individuals. We have unique economic and social behaviors. There is never a “one size fits all” approach that you can take when creating a brand video. Do you know what demographic group they belong to? How can you motivate them to action? What do they want out of life? 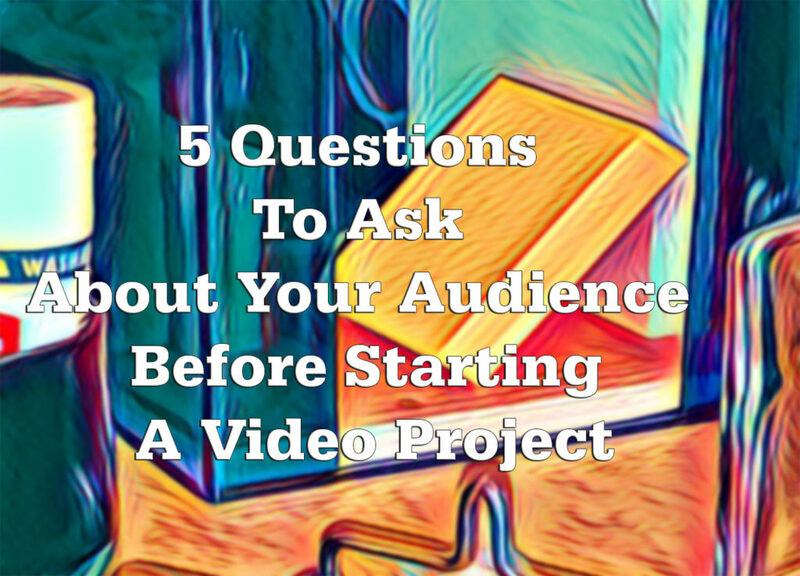 These are some of the questions you must ask yourself before you can start creating a video. Only when you know who your audience is, can you create video content that will be relevant to their lives. 2. How Do They Want You To Tell Your Story? Arising from your audience research you will get information that will help you create a video that matches your audience expectations. You will get insights into a style and tone that is likely to suit them. You might even get insights into the visual narrative that will appeal to them and what type of humor is appropriate. The better your research at the start the more appropriate your video content will be for your audience. 3. Why Will Your Audience Care About Your Story? Relevance is what makes your viewers care about your video. How relevant was your video to their lives? Did your video solve some problem your audience had? Did your video engage your audience on an emotional basis? It is not enough to solve a problem; your viewers need to care about your solution. The way to make a video relevant to your viewers is to make them the hero of your story. 4. Where Are Your Audience? Approximately 2.6 billion people use some form of social media platform. Some of these people use multiple platforms and some use just one. It is very important that you know which social media platform your audience use. Also you need to keep an eye out for emerging niche platforms that may attract your target audience. While I am reluctant to make broad generalizations, here are some indicators of the types of audience you can expect on the following platforms. As one of the dominant social network platforms, it has quite a cross section of the population from trendsetters to your grandmother. This means that innovators have probably moved on. That said most brands would probably find a target for their videos on Facebook. YouTube is often referred to as the worlds largest search engine and this means it is perfect for brands that are creating videos that solve problems. “How to videos” do particularly well on YouTube and can have a long shelf life. This is a great platform for professionals and B2B video content. LinkedIn visitors are typically in networking or skill development mode, so any content that meets these objectives will do well. Keep in mind time is precious for LinkedIn and text content typically does better than video. Instagram has over a billion users and as such has a broad audience appeal. Initially conceived for visual images, it has since embraced video. Instagram users are consuming large amounts of content so your video content needs to be eye catching, give valuable brand insights and be posted regularly. The demographics on Twitter favors the young and the content can be very varied. It is hard to make content rise above the constant chatter. So as you can see it is not enough to know what platform your audience is on you need to tailor your content to match that platform. 5. What Do They Want To Takeaway? Part of the research you do at the start of a video project to help you understand your audience is what your audience will want from video. Nobody watches a video without an end point in mind. They either want to learn something new, or they want to be entertained and sometimes they expect both. You need to identify the takeaway point that will make your audience feel satisfied on watching your video. What your audience gets from your video, decides on whether it was useful to them or not. Video marketing is all about using your imagination to tell a creative, innovative visual story. The object is to tell a story that sells itself. This can only be done by totally understanding your audience and what matters to them. Time spent researching your audience is probably the most important investment in creating a new video. Posted in iPhone Videos on November 8, 2018 by admin.